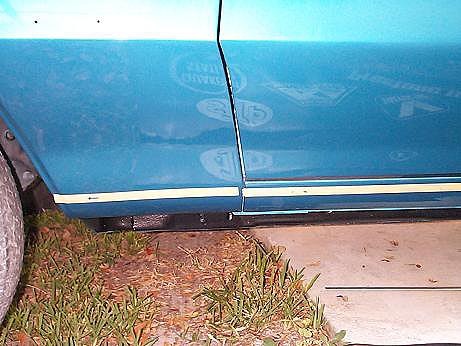 Here is a complete installation of the GS rocker panel covers on a 70 GS conv. 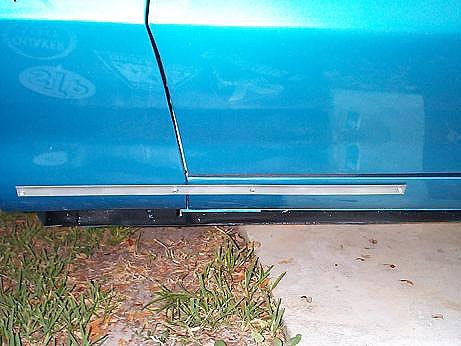 Here is a close-up of the rocker panel cover and the bottom of the door opening or the top of the metal rocker. Gap between the top edge and the stainless rocker cover is approximately 1/4". Notice the stripes are red. Skylark Custom and GSX models had black stripes. To start the installation, I use 3/4" masking tape on the area where I will locate the holes. There are 4 holes for the mounting strip. 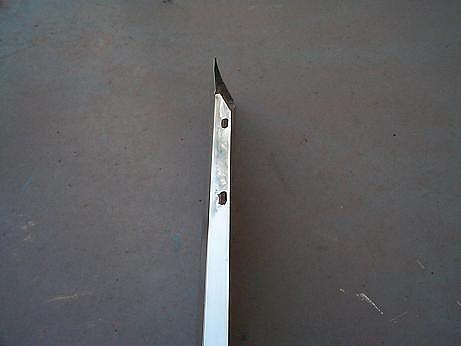 The mounting strip holes are 2 1/8" from the bottom of the rocker edge to the center of the holes. I use a 3/32 drill bit to drill the holes. Mark each location with a marker and then use a center punch to dimple each starting hole location. You can use a 7/64" drill also. The dril size is for #8 sheet metal screws. Here is the completed installation of the mounting strip. 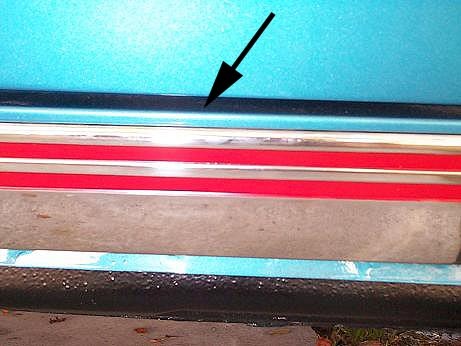 The first hole is approximately 2 1/2" inches behind the edge(indicated by left arrow) of the fender. Here is the masking tape line again. For the Buick rocker mounting discs, measure 1 7/8" from the bottom edge up. Notice this dimension is different than the 2 1/8" for the mounting strip. All mounting discs are installed. The one closest to the rear wheel well is approx 2.5" from it and going forward...they approx 10-12 inches apart. Buick installed 5 discs on each side. I installed 4 of them because the Buick discs are not being reproduced. A fifth one is not needed and no one can tell if you have 5 or 6 installed. 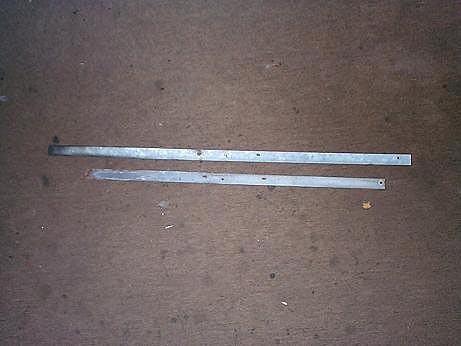 I use hex head #8 1/2 sheet metal screws to mount the strip and discs to the rocker panel. Here is the bottom side of the rocker panel cover. Notice two oval openings for screws. 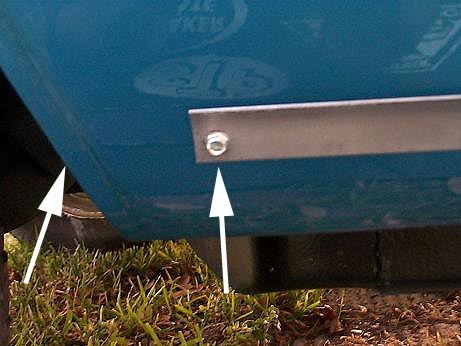 This indicates the rear (closest to rear tire) of the rocker panel cover. The panels are designed for left and right installation. By locating the two oval holes, you will know which side you have. Originally, Buick installed 5/16" hex head #8 screws. I like to use #8 Phillips head screws. You will need to drill holes in the bottom of the car's rocker to install these screws. 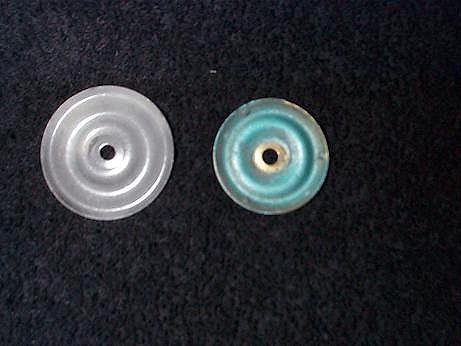 Here is a comparison between the Buick disc on the left to a Cutlass disc on the right. 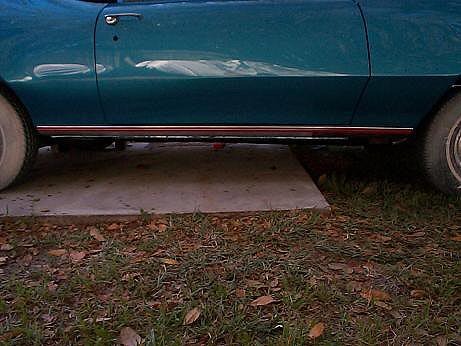 The Buick disc is 1 5/8" diameter and the Cutlass is 1 3/8" If the smaller discs, you will need to locate your holes higher, instead of 1 7/8 you will need 2"
Full size Buicks use a similar mounting strip. The top one is from a 70 Wildcat 4dr and the lower is from a Skylark. The top one measures 31 inches while the Skylark version is 25 1/2" You can shorten the ones from full size models to fit Skylark/GS models. 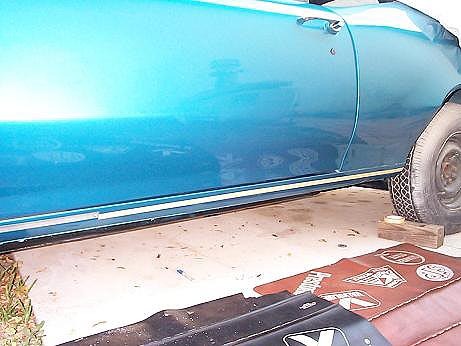 You can find the Skylark rocker mounting strips on 2 or 4 door models such as the Skylark Custom. The 4 dr models use a similar rocker panel cover but it is longer because the wheelbase on a 4dr is 116" and a 2dr is 112". If you can do some basic metal work, you can shorten the 4dr versions to fit a 2dr. 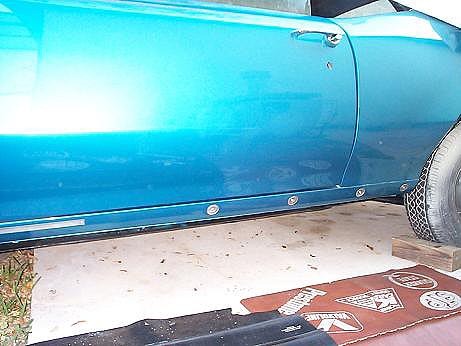 The rocker panel covers are currently being reproduced. Expect to spend 30-40 minutes per side for installation. If you are going to polish/buff the covers, expect to spend another 30 minutes per side and add 15 minutes per side to mask and paint the stripes. Use a red scotch-brite to lightly scuff the stripe area. I use the red scotch brite wrapped once around a paint mixing stick to scuff the recessed stripe area. Works great!